Thought it would be fun to give everyone a place to post her personal hopes and dreams. What's in your heart? Feel free to go anonymous if you want. We'll put everyone's hopes and dreams in a virtual glass jar, to hold and sort and ponder and wish and pray. My personal dreams and hopes are a few -- always for my son first, and good health for me and those I love. Oh, and the perfect adhesive! My family's health and safety first and foremost! 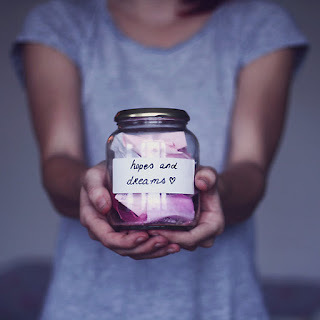 hope the dreams come true. Also my and family's health and safety! For myself, my "secret" dream is to become a lay speaker in the Methodist church. Also, to become a librarian. And to write. And to live in a clean and simple life. And to live in peace with everyone. Wow, I had no idea I was so ambitious! Thanks for making me dream. My personal hope is to show lovingkindness to everyone. My dream is to be happy with the life I have and not be jealous of others. My secret dream is to have the kind of life that would make me think, ' holy cow this is my amazing life!' And to know that I'm living a life that's worth all the stress. And my very secret dream is to win the megamillions lottery and give it all away ... oh, and good adhesive too! Health, happiness and peace for my family, friends and the world. It's not too much to ask, right? It's what I always hope for every single night before I go to bed. didn't realize that you had a hot spot for Sante Fe. Here's hoping it works out some day!! Most of all I wish good health, happiness, peace, and security for my son. I also wish for the whole world of humans no more greed, hate, war mongering, and destruction. As for myself, I'm in a good place. Content and happy. A dream would be to travel America in a camper van with Rich and the dogs. I also wish Golden Retrievers lived longer. we all want that for our sons, don't we? maybe the camper van travel could come true?? health and happiness and family = perfection. Disney would one up the whole enchilada!! I hope and pray for my son's safety and health and future as he navigates the transition from child to adult, having just turned sixteen a few weeks ago. I dream of peace, not only in a "broad brushstroke for everyone" way but also in my family and in my own heart and soul.